Next up in my crazy flurry of blogging is this incredibly soft and sweet dress from the Japanese sewing pattern book, Happy Homemade: Sew Chic Kids (affiliate link). This is View J, the V-Neck Dress with modifications. I originally decided to make this as a nightgown for Harper after seeing my friend Monica's version. But really, it works for anytime wear. It's superbly soft and breezy, so it's the perfect hot-weather dress. And boy, have we been having some hot weather! I *think* this is the mint colorway of the Pocho print Nani Iro double gauze? But I'm not positive, and I can't find my receipt from when I purchased it. It's been in my stash for quite a while! I only needed one yard with the bodice modification I made. I made this in the smallest size included in the book, a 100, and it's absolutely perfect. Everything I've sewn from this book has been spot-on for the measurements given. Side note: this book is now available in English, but I actually used the Japanese version with absolutely no problems. The illustrations in these books are so good, any intermediate or advanced beginning sewist should be able to figure them out. I also don't find the pattern pages to be as confusing as some would assume. Once you take a deep breath and realize how clearly labeled they are, tracing them is a breeze. Even adding seam allowances is no biggie once you wrap your head around it all. As for my modification, I lined the bodice and used a button loop in the back instead of a tie. I hand-sewed the bodice lining to the skirt to give a nice, clean finish. I'm not sure what got into me as I'm usually a stitch-in-the-ditch kinda gal, but this fabric demanded to be hand-sewn. Have you ventured into sewing from Japanese sewing pattern books yet? If so, do you love it as much as I do? Okay so FIRST: In case you are wondering, I am NOT staying up at all hours sewing. Most of the things I've been blogging in recent days have been in regular rotation for weeks or even months. I just haven't gotten around to photographing and blogging them. Plus, Harper has only recently decided that she enjoys tolerates photo shoots. If she decides she doesn't want to do it anymore, or if I start feeling weird about it, who knows...maybe we'll stop. But for now, how cute is this top?! 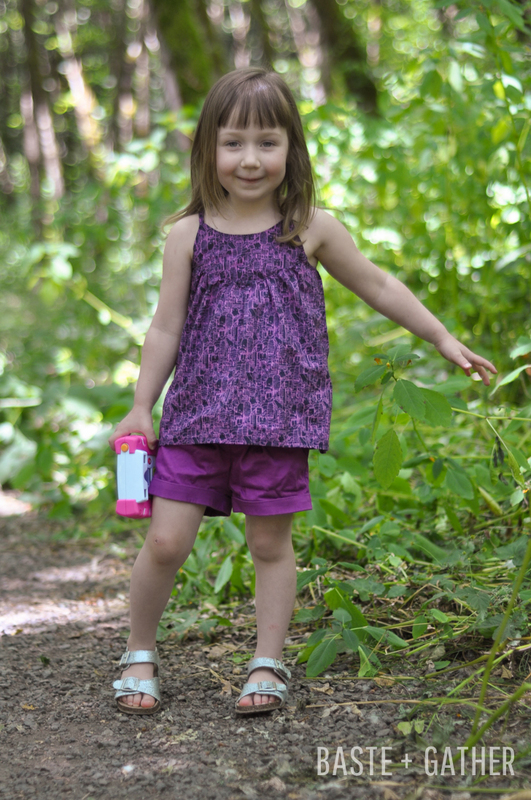 This is the Swingset Tunic by Oliver + S, and I'm embarrassed to say this is the first of their patterns I ever sewed. It's kind of hard to believe since Oliver + S is so well regarded (and has been around so long)...but for whatever reason, I have only recently purchased some of their patterns. They seem great in terms of fit, style and construction, but I am a little sad that Harper is already at the top end of the size range for the patterns I purchased (most of them go up to 4 or 5 and then have to be re-purchased for the higher sizes). Plus, they are quite pricey, and the PDF versions aren't laid out the best for at-home printing. I know others have complained about this, however, so hopefully they are listening and fixing this in future releases. BUT, this top did end up extremely cute, and I love the fit on Harper. I made a size 3 since I'd heard these patterns run a tad large, and it is perfect right now. She'll definitely be in a 4 by next summer (or even higher). I found the way the bodice was constructed at the buttons in the back to be a bit fiddly, but it turned out okay. I might try to do it a different way the next time around. This fabric is quite lovely and is a perfect alternative to quilting cotton when sewing garments. It has a much better drape and is more lightweight. I lined the bodice with Robert Kaufman Cambridge Lawn in Thistle. This fabric is very similar to the C + S lawn and also works great when lining Liberty of London fabrics. As for the shorts which you can see in the first photos, they are the Clover Shorts by Willow & Co. I previously blogged about these here, and they still fit since I made a size 3 for growing room. Vanessa made this exact same outfit combination (Swingset Tunic + Clover Shorts) and blogged about it here. I think they go perfectly together! What do you think? Have you sewn with Oliver + S patterns? Do you love them? Have you noticed the same things I mentioned above? 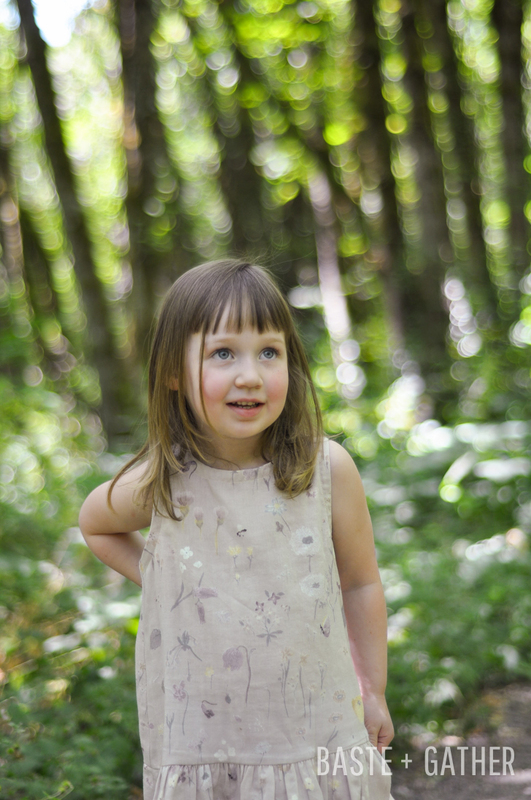 I love simple little girls' dresses, especially when using a prized fabric. The Charlie Dress Mingo & Grace is perfect for highlighting the richness of this Nani Iro Sen Retsu double gauze (France colorway). And with all the 95-degree+ days we've been having here in Portland (WTF? ), it's great for staying cool, too. Just perfect. I have only good things to say about this pattern. I sewed a size 4 as suggested by the pattern, and I think it's a great fit for Harper with just a little room to grow. (She is on the small side of the 4.) It sewed up quickly and easily, and I was able to get the entire thing out of one yard of this unexpectedly narrow fabric. Speaking of the fabric...isn't it lovely? You can't tell in these photos, but some of the flowers have what looks like metallic gold paint on them. I was happy to get these hand-me-down Saltwater Sandals from my friend Anneliese since they are the perfect complement to the dress. It's also amazingly soft...so soft this could double as a nightgown. But it's too pretty to only wear at home! I will let the photos do the rest of the talking! And when you're done here, go get this pattern for a special little girl in your life!